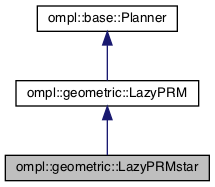 Run LazyPRM with the "star strategy". Instead of setting the value "k" for how many neighbors to connect, automatically compute it based on the coverage of the space, guaranteeing optimality of solutions. Definition at line 66 of file LazyPRMstar.h.